The Persuasion are one of Perth’s most unique bands. Taking their influences from the great Rock, Fusion, RnB and Jazz artists of the last 30 years, They have a young fresh and energetic sound and vibe that is taking Perth by Storm! The young band began as a creative outlet, to experiment with musical ideas outside of the work environment. The incredible musical chemistry they shared, as well as all being long time friends pushed them to pursue the project to the stage, and the group debuted in 2015 at the Llama Bar, following in the footsteps of some of Perth’s finest musicians who have now gone on to receive international acclaim. 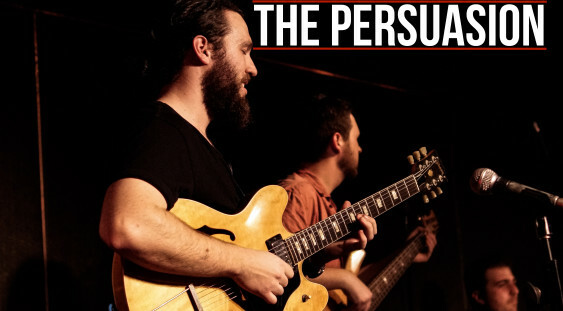 The Persuasion released their Debut EP in 2016, featuring a fresh sound for the Perth original scene. They will be playing many songs from this record as well as new original material, and tunes from their biggest influences, such as Snarky Puppy, Void, Solve, Forq and more. All experienced musicians in their own right, members of the band have played with Dami Im, Paulini, Johnny Ruffo, Daryl Brathwaite and many more. This weekly residency is an incredibly exited chance to experience the band in a beautiful intimate venue, and experience the energy for yourself! You will not want to miss catching The Persuasion this month! DRINK SPECIAL – $5 glass of Ellington White, Red, Rose or Bubbles!